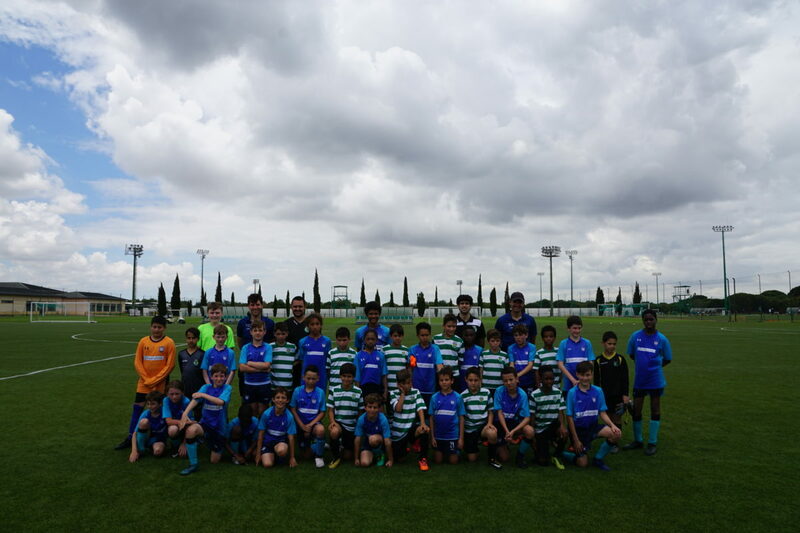 Boys woke up excitedly to play the friendly against one of Sporting’s schools that was visiting us at the training centre. After a full breakfast, everyone was taken to the conference room to speak about the match and given key points to focus on during the friendly. This again was a great moment since it replicated the real pre match atmosphere that Sporting’s players have before their competitive matches. With equipment such as TV, wall football board and speakers at our disposal, every aspect of the game can be meticulously presented using video analysis, football diagrams and such to fully prepare them. On our arrival to the pitch, the visitors parents awaited curiously for us and were incredible supporters throughout the game. In the end, some even asked for some of our training tops as it’s a customary treat after the Portuguese matches. On our side, Coach Bruno’s family and two of our players parents celebrated enthusiastically our game under the fantastic blue and clear sky of Alcochete. In the afternoon, a visit to Sporting’s stadium and museum awaited them. Everyone was surprised to find out that Sporting Club of Portugal extends way beyond football and discover that Athletics, Cycling are other strong sports with former athletes being Olympic medallists. In the end, after returning to the training centre, boys were finally given some free time to enjoy each other’s company while exploring the Sporting’s campus.